You Must Select A Word Goal To Use This Mode. This website is mutating. I don't want to change too much because I know a lot of people use the web version on a regular basis. The old server was pretty crashy so I've updated it and I've tried to improve things without breaking anyone's habits. The website now stores a cookie on your computer that keeps track of your accumulated wordcount and how many times you've visited. Regular website users now have the option to hide the Write or Die demo if you're just here to write. Once you hide the demo interface you'll see instead some widgets which will change from time to time with news and links. 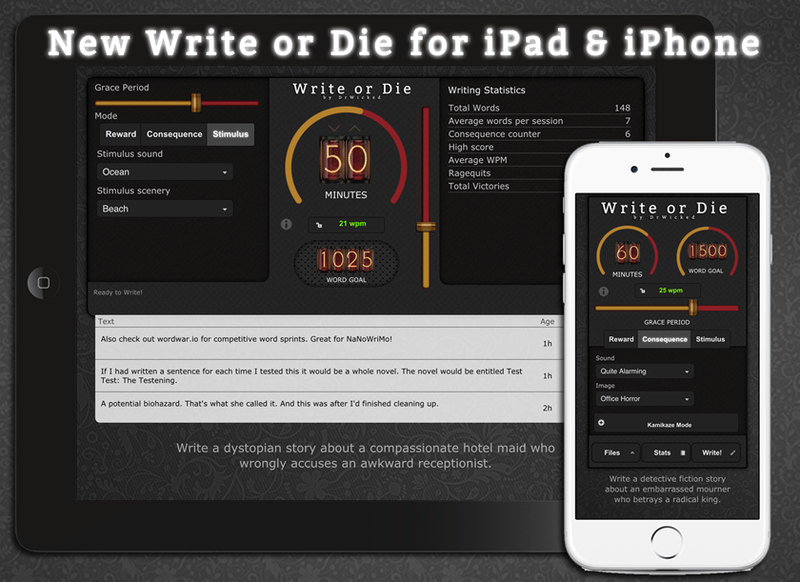 Write or Die iOS App! Now you can Write or Die wherever you are! Works for both iPad and iPhone. Android version coming soon. New online Leaderboard for Write or Die! Over 1.5 million words written so far! Only writing statistics will be submitted. If you'd prefer not to be shown on the leaderboard simply leave the nickname field blank in the app. You can now use VLC in Stimulus Mode! Load your favorite writing music into VLC (an open-source media player) and Write or Die will play it as long as you keep writing and fade it out it if you stop. It takes a little setup in the VLC preferences, here's how. Replaced countdown with more robust countdown clock. Mac version now has menu bar for Copying, Pasting and navigating between app windows. To update, revisit the original download link you received in your email and get the latest version. If you use Gmail, this search should find the update email. Fixed a pernicious issue with time adjustment and wpm locking. Window positioning fixes. For some reason the window would position itself off the bottom of the screen, obscuring the exit button. Added Escape key functionality. In the writing window, you can press escape to go back to the control panel. Added notice about dragging the writing window, you can drag the Write or Die 2 title in the top right to move the window. If you increase your wordgoal while the WPM lock is enabled and you go over the maximum time goal, WPM unlocks to keep things more accurate. Fixed timegoal arrows which were not working properly. Fixed bug where exit button would disappear and the only way to quit was to force the app to close. Added profile link to Twitter share button. View your writing profile by clicking the profile link in the stats tab. Save in project subfolders. You can now organize your writing into projects by creating subfolders in your Save directory and select which project you'd like to save to. Custom background color now works, oops. Write or Die is an application for Windows, Mac and Linux which aims to eliminate writer's block by providing consequences for procrastination and, new to this version, rewards for accomplishment. Historically Write or Die has specialized in being the stick in the carrot/stick motivation continuum, but it's time to experiment with encouragement. Please play with the user interface, check out what new options are available, then read this quick intro. I hope you enjoy the new features. One of the biggest improvements is the inclusion of visual stimulus. Instead of just writing to avoid annoying sounds and alarm warning colors you can now customize your stimulus. If you like to see a cute puppy after you've reached a certain number of words, you can. If you'd like to write in fear of a jiggling spider, you can do that too. This version of Write or Die introduces the concept of positive reinforcement. Sometimes the journey down the blank page seems a long and desolate one. Reward mode helps you mark your progress along the way. You can finitely adjust how frequently the program rewards you. Set a word goal and tweak the incentive frequency slider to increase or decrease the frequency of word count rewards. You can also select a directory of images for use as custom reward images, if you have a folder of your favorite pictures and you'd like to see those pictures as rewards. Write or Die can be nice and comforting now! Stimulus mode allows you to set up a writing environment that is conducive to concentration and focus. It provides a neutral, positive stimulus to keep you writing, when you stop writing, the nice environment goes away. This is especially helpful if you use headphones. You have a variety of options for sounds and backgrounds, from the steady purr of a cat to some nice neutral white noise. 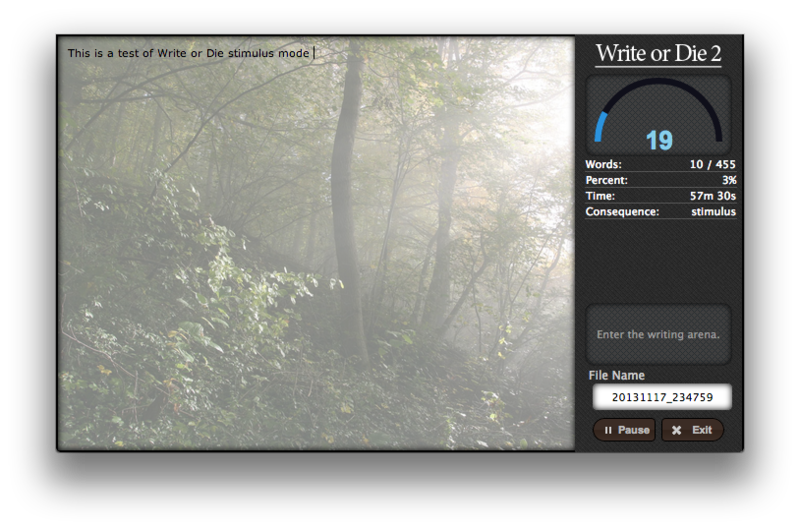 The background image can be changed as well so you can write while looking at a beach or a forest in the background. Custom Playlist allows you to create a playlist of your own music so that you have extra motivation to keep writing and keep the music playing. This is the reincarnation and refinement of the core concept of Write or Die. Write, and if you don't write, there are consequences, but now they're more interesting and varied. Everything is randomized within categories to provide you with new terrors every time. And now, with the addition of visual stimulus, you can finally write to avoid spiders or the disapproving glare of grumpy cat. Kamikaze mode is also still very much in evidence but I've refined it a bit. The wee little word monster that runs kamikaze mode has developed a more refined sensibility now. These days he only likes vowels. If you turn on kamikaze mode and allow consequences to ensue your words will be systematically disemvoweled. Startle Mode is a new addition which allows you to disable the warning color which typically precedes punishment. Useful if you find yourself getting a little too comfortable. Simplified saving system and set-and-forget autosaving ensures that you won't lose your writing. Extra-fine controls to customize your writing experience. There are a number of features I plan to implement soon but which were shelved in order to get this out <s>in time</s> <s>almost on time</s> <s>extremely</s> fashionably late for NaNoWriMo. I'm always on the lookout for new sounds both pleasant and punishing, I will add them as I discover them. I have the code ready for this I just have a lot of tweaking to do. More stats, more fun with images, more knobs to twiddle. What if I don't want to use PayPal? If you'd rather not use PayPal you can use an alternate method of payment. <br/>Click here and select "Pay by Card"
Do I need an internet connection to use Write or Die 2? Nope. You only need to be connected to the internet to download the program or update your stats (optional). My window is stuck off the screen, what do I do? I'm working on fixing this bug but sometimes the writing window will appear offscreen. If this happens, you can press Ctrl+Shift+R to reset the window positioning. Make sure your work is saved first as this will also reload the app. How do I set up VLC playback in stimulus mode? Visit writeordie.com/vlc for instructions on how to set up VLC. What file type does Write or Die 2 save in? All your work will be saved in plain text files in the folder you specify. You can then import these files to your word processor of choice. Mac OS X defaults to the strictest app security settings, only allowing programs downloaded from the app store to run. You just need to go into System Preferences and Allow All Apps. Watch this if you need guidance. Visit the link that was emailed to you (search for SendOwl if you can't find it), from there you'll be able to download the latest version. If you've misplaced the link, visit this link to recover it. The original web version and the whole original site is available at oldandbusted.drwicked.com but the new web version is way better and available at the top of this very page. Change the settings and click "Try" to begin writing. Can I still buy the original desktop edition? At long last wordWar is ready. Originally and buggily included in Write or Die 1, now wordWar is it's own standalone platform with a robust backend server and great new features. You can write with your friends whether you're sitting next to them in a coffee shop or they're on the other side of the world. Challenge your friends to see who can get their draft done quickest. It's always free to join wordWar games, just enter a nickname and find a game. If you'd like to host your own games as well as log your statistics and gain experience, get a Pro account. Just $20 gets you a Pro account with all the additional customizations listed above as well as more features yet to be implemented. I designed wordWar with teachers in mind, the first real life beta test was a bunch of middle schoolers, a lot was learned. Get a Pro account for your classroom, start a room and share the URL with your students and you're up and running. Simple to set up, start or end a class with 5 or 10 minutes of wordWar and get your students excited about writing. If you're a teacher and you'd like a free wordWar Pro account, fill out this form and I will be happy to help you. All wordWar needs is a modern browser and an internet connection. Everything is web-based and real-time. The only other requirement is a friend, future friend, or enemy to compete against. Regardless of who wins, everyone gets writing done! All content copyright Write or Die LLC © 2016 • All rights reserved. the old site is still available at oldandbusted.drwicked.com.